People often forget about the cultural heritage of Dubai. From the world’s largest manmade island to the otherworldly Museum of the Future , Dubai is a glass-and-steel preview of the future. The city is regularly (and rightfully) celebrated for its superb planning and vision, as well as its cutting-edge modernity. But as ambitious as the city might seem, Dubai isn’t just the city from the not-too-distant future. If you’re hungry for something authentic, head to the cultural heart of Dubai. 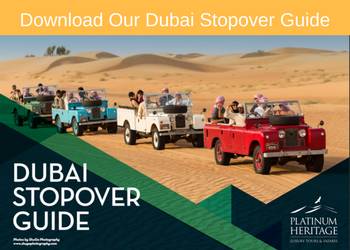 Hop on a traditional boat for a leisurely cruise, haggle for silks and spices at a souk, and take a heritage desert safari. So whether you’re a first-time visitor or an old hand looking for new experiences, you’ve come to the right place. 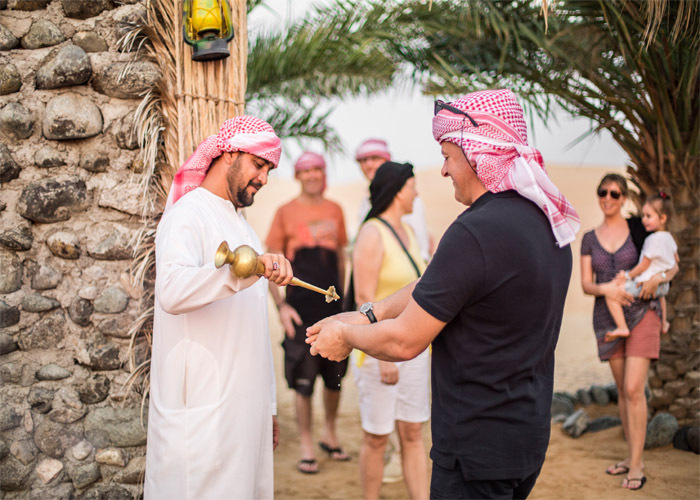 Believe it or not, Dubai’s traditions aren’t just alive–they’re thriving. You just have to know where to look. Long ago, Dubai Creek was home to the site of the first settlement in the area. 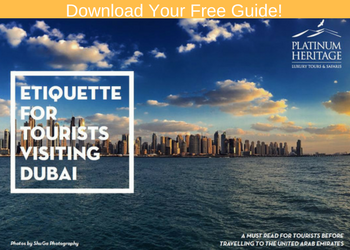 Today, Dubai’s best preserved (and most authentic) buildings, city blocks, and markets are still located near Dubai Creek in three, well-preserved districts: Bastakiya, Bur Dubai, and Deira. Shopping at a souk, or traditional Arabian market, is a multi sensory experience. From fragrant spices to decadent silk, a souk will stimulate all six senses–the last being your sense of negotiation. You’ll be welcomed with tea, snacks, and warm conversation, all in preparation for the friendly (but intense) haggling to come. Remember to take your time, and most importantly, smile; it will get you further than you might think. The gold souk might be the most famous of Dubai’s many markets. Located in Deira, the shops boast an array of gold jewelry in a variety of designs, from traditional to modern–and everything in between. From earrings to necklaces to bangles and even intimate wear made from gold, you can find everything here in a range from 22 to 24 karats. Some pieces are inlaid with other precious and semi-precious stones, or range in color from platinum white to rose pink. Spice souks are the quintessential image of the Middle East, and Dubai’s do not disappoint. Stash your smartphone, close your eyes, and let the Spice Souk take you back to the fragrant, delicious past. Just steps away from the gold souk, Dubai’s spice markets contain thousands of stalls, stacked with heaping mounds of spices. They come in ever flavor, taste, smell, and texture known to man: cinnamon from Indonesia and Vietnam, turmeric from India, and saffron from Kashmir and Iran. Be sure also to try other products, as well, like dates, dried fruits, shisha, and even jasmine and basmati rice. Across the river from the gold and spice souks, Dubai’s textile souk is located in the historic heart of Old Dubai. For generations since its settlement, the area has been home to merchants and their wares. Today, it just so happens to have an expansive collection of the finest fabrics from across the world. Touch soft cashmere from the finest pashmina goats, sample silk that empires rose and died for, and try on the distinct keffiyehs and shemaghs, native to the region. And don’t be afraid of the friendly shop cats, they’re there for your enjoyment. Looking for an authentic way to explore? Abras are traditional wood-hulled boats with covered tops and have been a mode of transportation throughout Dubai’s rivers for ages. For just 1 dirham, you can ride the length of Dubai Creek, from Bur Dubai in the east to Deira in the west, running from 5am to midnight. It’s a great way to experience the cities sights with a relaxing salt breeze on your face. The best times for an abra ride are early in the morning, where temperatures are low and the city is quiet, or late at night, when the bright lights of the big city glitter along the shores of Dubai Creek. Museums are great, but for a true experiential cultural journey, try Platinum Heritage’s authentic desert safaris. Get a real-life glimpse into a traditional Bedouin lifestyle. You’ll be able to taste, see, and do as the desert nomads did for generations, from falconry and traditional dance to camel rides. Platinum Heritage offers a number of great options, from an overnight desert stay with a private tent, luxury meals, and the soothing calm of the desert, to shorter, day and evening trips with cultural activities, such as henna, breadmaking, and music. Watch majestic falcons swoop down on their prey, ride restored Land Rovers from the 1950s, and chat with new friends and loved ones alike under the vast desert sky. From bustling souks to full-on desert safaris, Dubai’s culture is still strong today. Don’t miss these authentic, varied flavors on your next trip to the city.